Adventure professional Matt Keating demonstrates his ability to be in three places at once without even leaving his specialty outdoors store. His Badass Outdoors shop in Littleton’s Tilton Opera Block boasts textured tin ceilings and pea-green wainscoting that reaches high up the corrugated walls. The space is carefully decorated with vintage survival gear, yellowing photographs of mountain life and bits of paper bearing pithy, hand-scribbled quotes. And, yes, there are the axes. In other words, he’s a hipster. As for being a flatlander, Keating is quick to point out that he moved to Littleton four years ago from an 8,000-foot perch outside Prescott, Arizona, where he was teaching college classes on wilderness literature and honing his skills as a survivalist. Which pretty much settles that debate. “New Hampshire’s problem isn’t flatlanders anyway,” he says. “It’s fatlanders.” He’s referring to the people who live in this outdoor paradise but prefer to spend their free time sitting on couches watching television and drinking beer that isn’t even made here. I like Keating at once, but I’ve been sent here on a mission. Growing up in New Hampshire, you learn to operate on a default setting of suspicion. This whole business, whatever it is, will require some looking into. 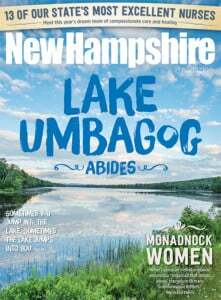 It began with a phone call from Rick Broussard, editor at New Hampshire Magazine. Whisperings had been heard that something was going on in the North Country. There were apparently a bunch of 30-somethings up in Littleton trying to make it cool — or to convince young locals that it already possessed the rudiments of coolness, and that they should stick around. Maybe, just maybe, it was even cool enough to draw youngsters in from elsewhere, giving northern New Hampshire the socio-economic pick-me-up it so sorely needs. I’d been told that Keating was the unofficial spokesperson of this push. It was significant that I came into Littleton that afternoon not from “down below,” as they say up north, but from the other side of the Connecticut River, where young flatlanders with high ideals are nothing new. We New Hampshirites, with our insistence on “authenticity,” may actually be the only ones who worry over the threat of such artifice. We’re a proud state and one that is fiercely resistant to change. Vermont, on the other hand, has cautiously welcomed new ideas. Downtown Littleton has become quite a colorful place in recent years. The sparsely peopled North Country famously bucks this trend, and that’s why Granite Staters worth their salt identify powerfully with this region — whether they’ve been there or not. But for how long will the North Country hold out? Folks from Coös may contest that Littleton, a mere two-thirds of the way up the map, can truly be considered the North Country, but it does meet the standard geographical condition. And because of its proximity to Lincoln and two interstates, there’s a lot at stake. Walking along Littleton’s Main Street at 7 a.m. one late-March day, I felt the sting of cold on my cheeks and heard the unmistakable tick-tick-tick of studs on all the tires. I ducked into the Coffee Pot Restaurant, where a few 70-somethings sat talking in shallow booths along the wall. From behind the bar, an aproned waitress greeted me cheerily. She persisted in her friendliness and kept my coffee full, even after I paid my bill. Matt Keating knows a thing or two about surviving. A longtime student and teacher of bushcraft, in 2014 he was invited to spend two weeks crossing the Panamanian jungle, with nothing but street clothes and tethered to a total stranger by a six-foot cord, as part of a reality show. What he’s less sure about, though, is why so many like-minded people happen to have landed in Littleton at the same time. He’s an intellectual who loves to talk, so he’s got droves of theories about this serendipitous convergence. We spent two nights at the local brewpub debating just this question. The pub’s CEO, Jeff Cozzens, has a few academic credentials himself, but, being a practical man as well, he’s got a more definite idea of what makes Littleton so enticing. Cozzens hails from Traverse City, Michigan, and knows whereof he speaks. Although it’s larger than Littleton, Traverse City is also a northern town that has successfully improved on its advantages. With a friendly Midwestern smile, a fireplug frame and a hearty handshake, Cozzens exudes competence and reliability. He’s a guy you want on your team, and I see why everyone thinks so highly of him. Jeff Cozzens with Schilling Beer Co. in the background. The nearby Ammonoosuc River adds charm and provides for easy after-work fly fishing. I didn’t know, but her remark made me twitch — an index of recognition without understanding. “Who or what is Pollyanna?” I wondered for an instant. It seemed odd, because on my way into town I’d heard a commentator on NPR say something smugly about “the Pollyannas” doing this or that. At the time, I’d supposed it was some sort of learned reference to Tolstoy’s famous estate, Yasnaya Polyana, and thought nothing more of it. Smiling broadly, Cozzens asks me how I liked my beer and then launches into a description of its flavor profile. He opened Schilling Beer Company in 2013 with his brother Stuart, who abandoned a doctorate to follow the family dream, and lifelong best friend and fellow Michigander, John Lenzini, a professional chemist who had been living in Austria for a decade when he decided to decamp to Littleton. Lenzini uses his language skills to excavate authentic European recipes that are beyond the reach of most American brewers, and his chemistry know-how to translate barley into beer. It’s a dedication you can taste. The core team at Schilling Beer Company is Jeff Cozzens, his brother Stuart and his best friend John Lenzini. The brewpub is housed in the old grist mill, downtown Littleton’s erstwhile reason for being, which is perhaps as good an example as any of what Jeff Cozzens means when he talks about successfully adapting to the new economy by using elements of the old. “A lot of people in the North Country see decline and say, ‘It’s always going to be this way,’” Nadeau explains, “but Littleton resists that.” She continues. “Like our river. We’ve got this beautiful river flowing right through town, and Littleton has made a priority of shifting its attention toward it as something that makes this a pleasant place to live.” The guys from Schilling sometimes don their waders after work and plunge into the tumbling water, right outside the brewpub window, to unwind with a few twilight fly casts. The Ammonoosuc flows down from the flanks of Mount Washington itself, just a 30-minute drive to the east. This ideal geographical situation is why Matt Keating calls Littleton “the perfect little mountain town that doesn’t know it yet.” For him — and Jeff Cozzens is quick to agree — outdoor recreation, in its many guises, is the lingua franca that will be the North Country’s saving grace. One of the reasons I like Keating so much is that when he says “outdoor recreation,” he’s not talking about living in some plein air REI store. He takes a more holistic approach that blurs the boundaries between what most people think of as outdoor sport and everyday life. The shared vision of landowner Taylor Caswell and mountain bike enthusiast Blake Roberts, who arrived from Kentucky armed with a degree in recreation management, is just one example. Parker Mountain is a 1,900-foot hump that rises gradually to Littleton’s north. It is criss-crossed with old walking tracks, skidder paths and snowmobile trails. Thanks to Caswell’s generosity in allowing access to a crucial tract of land, a group called Parker Mountain Trails under Roberts’ direction is now in the process of improving, expanding and streamlining all this into a mountain-bike trail system that they hope may someday rival Kingdom Trails, the single-track mecca a few miles to the west in East Burke, Vermont. If they can make the trails inviting enough, they hope that Littleton will do the rest. “As a town, it’s got a lot more to offer than East Burke,” says one area resident. And in the winter, of course, there’s cross-country skiing. Parker is close enough that Matt Keating envisages it as an organic extension of downtown, and not as the kind of place you drive to and change into your “outdoor” clothes for a day hike. “I don’t like the phrase ‘day hike,’” he says. “I’d like to see cross-country skis leaning against the outside of my shop, from people who have just skied in along the sidewalk from off the trails, or watch mountain bikes cruise down Main Street in the summer on their way to Schilling for a beer.” He’s also interested in finding common ground with snowmobilers — a necessity to getting along up here. Outdoor enthusiasts Brad and Erin Shedd both grew up in NH’s North Country, love it and have no plans to leave. Brad Shedd is one of those people whose enthusiasms carry them in a thousand directions. If you had to pigeonhole the man with something so prosaic as a job description, you might call him a trail builder. Even that falls short, however, because what he does every day of the winter is deftly maneuver a $250,000 snowcat up and down the side of the ski hill at Bretton Woods, shaping snow into terrain parks with a keen sense of how people move over the ground. He designs and builds mountain-bike trails for the resort in the summer and, as of last year, is the boots on the ground for the Parker Mountain Trails project. Brad and his wife Erin constitute the puzzle piece that fulfills old New Hampshire’s borderline-neurotic need for the real thing. Unlike Keating and Cozzens, they were brought up in the North Country. Erin recalls trips to Manchester for shopping when she was a kid: “It seemed like it took six hours to get down there. And when you came back up through the Notch, you felt something was different. It was home.” She’s never left. After years racing at Bretton Woods, she began working for the resort and has since worked her way up through the ranks to the position of recreation director. Brad and Erin both love the region deeply and consciously foster the ideal of the “staycation.” “If you live in a place you love,” Brad says, “you never have to leave.” He spent part of a year traveling around the country after high school. One winter spent away from the North Country was enough for him to vow it was something he’d never do again. “That mountain,” he says, gesturing with his head in the direction of Mount Washington, even though we’re inside and can’t see it, “it’s like there’s a magnet in it or something.” He alludes to the mountain at least four times during our conversation, but never names it — as if doing so would violate some sacred code. The Brad and Erin Shedds of New Hampshire’s North may be its last best hope (although they are quick to point out that the Keatings and Cozzenses are a sine qua non). Their devotion to place has a fire in it I’ve rarely seen outside the Old World. They are cognizant of the risks of resignation and seem not to accept that time has to be a steamroller that comes in and flattens everything. “So you want to get out there?” Brad asks. “We just got in 10 new fat bikes, and I’m pretty excited about trying them out,” Erin says, handing me a helmet. She wheels one of the brand-new bikes out from behind the counter of the Bretton Woods rental shop, I try it for size, and the three of us pedal out the door and down the hill for a 40-minute tour along the wooded intervale of the Ammonoosuc, weaving in and out of the trees, greeted occasionally by stunning up-close views of the snow-covered Presidential Range. The Shedds, Jeff Cozzens, Amy Nadeau and Matt Keating are all convinced that people in the Littleton area have what it takes to embrace change in a way that is healthy and sets an example for the rest of the North Country. In addition to its perfect location amid mountains and rivers, Littleton has another key ingredient: a vibrant downtown. In 1997, the town launched a project to revive its Main Street in the wake of a local industrial collapse that had been eroding its commercial core since the seventies. The project raised more than $400,000 in its first week and poured much of that money into ensuring that Main Street storefronts were filled again. Then, in 2000, Wal-Mart arrived. The people of Littleton successfully kept the retail behemoth, and its inevitable small-box minions, away from downtown, but, even so, local business owners realized there was no way they could compete on price with such big players. They had to change. So they shifted to a strategy that prioritized quality over quantity. Strolling along Main Street between interviews, happy that business was booming, I stopped in front of the town library. An engraving at the bottom of a bronze statue caught my eye. The statue was of a cheerful-looking little girl with arms flung wide, and when I got closer I could read the inscription: “Pollyanna.” Out came the smartphone. Like a Greek goddess of gladness, a statue of Pollyanna exudes good vibes 24/7 from her perch on the lawn of the city library. Corny as it sounds, this was precisely what I saw happening in Littleton. Amy Nadeau was right. When Wal-Mart threatened to force Northern Lights Music to close its doors on Main Street, the owners shifted their focus from selling electronic media devices to selling high-end musical instruments. Sixteen years later, they are still a thriving business. Matt Keating takes a similar approach with his Badass Outdoors store. His retail offering is not an anonymous heap of everything the latest Backpacker magazine top-10 list says you must have. It’s an expertly curated “extrapolation” of Keating’s own gear closet. He sells only what he tests himself and considers “the best in every class.” (Jeff Cozzens used the same phrase about Schilling beers.) He tells me that “you should be able to come into my shop off the street and leave fully prepared to walk directly onto the Appalachian Trail.” It’s a fresh approach that defies the conventional more-is-better model of competition that drives Mall Town, USA. I find the same attitude again when I pay a late afternoon visit to Kim Hudson in her Little Herb Shoppe, right next door. The atmosphere is pleasantly aromatic, and the wooden floorboards creak out a welcome as I walk across the store to shake her hand. She makes me a cup of jasmine-infused tea and then pulls a Ziploc bag from her pocket. It’s full of tiny cubes of raw steak that look rather appetizing. My stomach growls, but her dog Lakota comes scampering over for an afternoon snack. One wall is lined with homemade tinctures, medicinal mushrooms, seaweeds, tisanes, tonics and Hudson’s own selection of dried herbs, almost exclusively North American. On the other side of the shop are essential oils and an array of books about herbalism, whole foods and natural living. Kim Hudson is not the only one living among plants. To hear Matt Keating tell it, there’s quite a collection of young, educated people within a 10-mile radius who are looking to the land to live richly without any expectation of getting rich. “It used to be called serfdom,” he quips. Having done a stint of northern subsistence farming myself, I have the same attitude. But we agree that we’re glad someone’s got the grit to do it. Heidi Cook and Kevin Gordon homestead on an old farm east of Bethlehem, Littleton’s hill-town neighbor. For those familiar with Bethlehem, put away any notions you may have of Gilded Age brahmins taking the clean mountain air as they stroll on the piazzas of grand hotels. Heidi and Kevin’s place is the kind of rough frontier farm on whose contours you can read the history of the continent — 26 acres of mostly woods and scrub, formerly cleared, encroaching on an 1840s farmhouse connected by a dilapidated ell to a vaulting barn with bones of unpeeled pine logs. Heidi Cook and Kevin Gordon manage both flora and fauna on their Bethlehem farm. Although it was only late March, in the south-facing windows of their farmhouse, seeds in starter trays had already germinated. Kevin and Heidi seemed shy as they showed me around the house and farm. They are an exceptionally good-looking couple, fresh and young, and there was something pleasing in the way this contrasted with the ancient rawness of their buildings and land. We wandered out through their back pasture — past pens enclosing pigs, chickens and a lone ram, kept separate from the ewes and lambs in the barn — to the poplar-choked back lot. This section, the better part of their property, was once pasture too, and the young couple are using their animals to reclaim it, bit by stubborn, granite-studded bit. They set their goats out first but found them too picky in their tastes. Last year, they experimented with pigs, and they’ll use them again this year when mud season’s passed. They still have a long way to go until the farm will look like, well, a farm, but already they’re able to produce enough vegetables to peddle at three area markets. Cultivating flowers is a specialty of theirs, for sale both at market and from the farm itself. And they have their animals slaughtered in St. Johnsbury to keep both their freezer and their customers’ freezers full of good, clean meat throughout the year. They stumbled upon this farm on their way to a hike in the Presidentials. Kevin and Heidi were living in Burlington at the time but had their eyes peeled for a cheap piece of rural land. “As you know,” Kevin explains, “as a town, Burlington has kinda got it going on, so we were thinking we’d stay in Vermont. We found this place. It was cheap and …” His words peter off as he sweeps his hand across the southeast, showing me the priceless view of the Mount Washington massif. “We never would have left Vermont had it not been for this place. But now we find we actually have a busier social schedule and a stronger sense of community.” He pauses for a moment, then says, “And the mountains are a big draw.” Kevin is a backcountry skier, snowboarder and a fly fishing fanatic. But what really ties it all together, both Heidi and Kevin agree, is the burgeoning young community in Littleton. “Recreation is really the thing that unites us,” Kevin says. “And Schilling. Having a place to go and really good beer to drink and food to eat — Schilling is huge for the community.” Before leaving, I ask whether they think Littleton will ever become like touristy Lincoln and North Conway. Kevin doesn’t think so. He still believes that the notches will keep the south pinched off from the north. Heidi is not so sure. When I talked to Jeff Cozzens and Amy Nadeau at Schilling Beer Company, they both told me the same curious story about Littleton’s post office, an imposing three-story Colonial Revival building with white marble trim that seems preposterously out of proportion to the town’s population of 6,000. The story goes that the construction materials arrived in town on the railroad and the workers raised the building — only to discover later that the materials had been meant for a different Littleton, presumably one a little less little. But by then it was too late, and they left it. Ernest Hebert, author of the finest novel written about rural New Hampshire (“The Dogs of March”), once told The Washington Post that the difference between New Hampshire newcomers and natives is that the newcomers believe in myth. This jibes with the fact that we are the least-pious state in the country — only about 20 percent of people here say they are religious. True or not doesn’t much matter: myths are stories we tell to try to understand and make ourselves better. Maybe it’s not such a bad thing that Littleton people think their post office has a more fascinating history than it really does. And the story of Pollyanna, the little girl who always looked on the bright side, even when everyone else couldn’t see a bright side to look on — it may seem foolish, but then again, maybe it works. Perhaps Littleton can show the rest of old New Hampshire how to stop settling for “it is what it is,” how to laugh a little more and start believing in the kinds of stories that keep us from becoming what we say we don’t want to become — the same as everywhere else.